Mimaki is honored to announce that three of our printer models won EDP awards 2016, presented at drupa 2016. 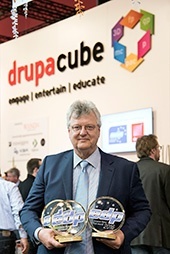 The awards were accepted by Mike Horsten, General Manager Marketing of Mimaki EMEA, at a special ceremony held during the show. 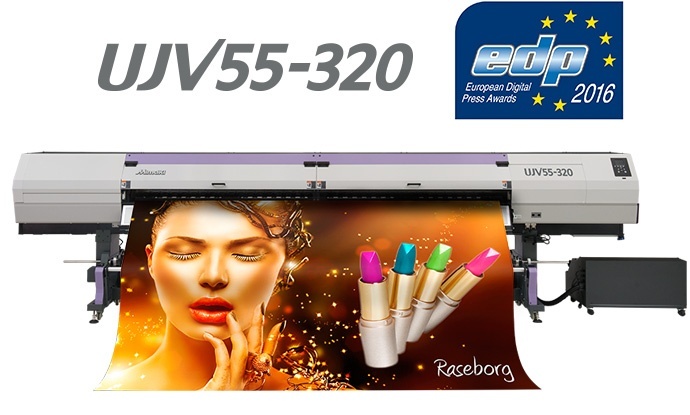 The UJV55-320 uses LED UV-curable ink and can produce vibrant colors with high degree of opacity. Print colors are not faded when the printing is used for the backlit signage. Instant-curing UV ink enables processing and operation immediately after printing, thereby significantly shortening the operation time. This model is also equipped with LED lights for checking the finishing on the backlit signage during printing. Real-time checks reduce missed printing and thereby decrease wasted media, improving the production efficiency. Although the price for this printer has been kept as low as possible, it can achieve a printing speed of 60m2/h*1. This model also incorporates unique technologies to deliver high-quality printing and continue stable printing operations. 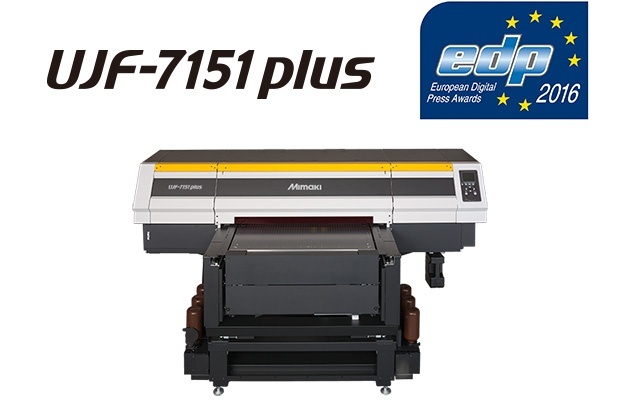 The UJF-7151 plus features the largest printing area (710 mm × 510 mm / 28 in × 20 in) in the UJF series. Two ball screws are installed at both sides of the print table, ensuring smooth movement of the print table while reducing vibrations of the main unit during printing. Therefore, this model delivers accurate ink droplet placement. Moreover, the novel printhead has an ink-circulating mechanism within the head that reduces nozzle failure. Versatile UV ink can be printed on wood, plastic, glass, and metal, extending the applicability of this model to industrial products, personalized gifts, promotional items, and more. The Tx300P-1800 is designed for accommodating market demand for high-mix low-volume print production capabilities and quick delivery. 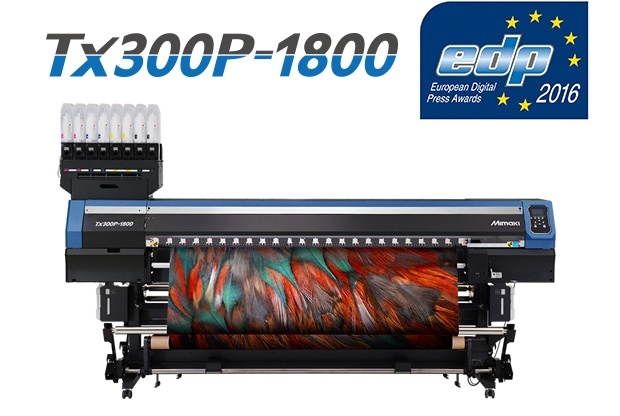 It employs a new printhead that ejects ink droplets at high speed to ensure accurate ink droplet placement with a high head gap, thereby providing high-quality printing results. Also, a stable textile transportation mechanism applies uniform tension on textiles to ensure stable printing at high-speed modes. Moreover, beautiful print results are achieved via the use of innovative inkjet technologies, and the print speed of the Tx300P-1800 is more than twice as fast as that of a conventional printer*2. *2: Print speed is compared with DS-1800. Sb420 ink is used for measuring the speed of the Tx300P-1800.